There are three selves in you and you are probably aware of them. First, there is the physical self consisting of your body and brain, or what you may call the physical mind. Next, there is the mental self, consisting of your mind, thoughts, perceptions, feelings, memory and subconscious. Then you have the observing self, different from both, which you may discern at times in your meditation. In the Vedas and the Upanishads, this observing Self is also called the witness Self, or the Seer. It is generally believed that this witness Self detaches itself from the body at the time of death and takes on a new body at the time of its rebirth. Depending upon to which religion you belong you may ascribe different qualities and attributes to it, such as whether it has a specific form and shape or not, and whether it is eternal or transient. Hinduism recognizes other hidden bodies, namely the breath body, intelligence body and the bliss body. In truth, they are its hidden aspects. In this discussion we focus upon the three Selves only, because irrespective of your religious beliefs and convictions, everyone can experience them in their wakeful, dream and sleep states. 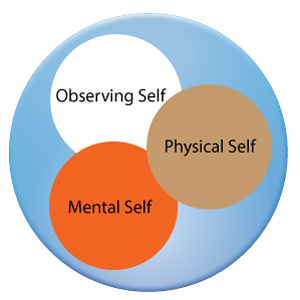 You may also consider the observing Self as the subtle Self made up of breath, intelligence or higher mind, and bliss. You enter these layers when you purify your mind and body and practice meditation regularly. Generally, during the wakeful state the observing Self becomes mixed up with both the mind and body. When it happens, we become attached to the things we perceive and suffer from attraction and aversion, attachment, desires, passions, afflictions and emotions. For the observing Self, the world is the field of observation, with which it become involved. This involvement or attachment is the prime cause of our mental states, stress, anxiety, insecurity, fear, anger, aggression, duality and so on. It is also responsible for our karma, latent impressions called Samskaras and rebirth. To experience peace, stability and happiness, we need to separate the observing Self from the mind and body and become centered in that rather than in our minds and bodies or the things we observe. If you become an observing Self and remain detached from the happenings around you, you perceive things with greater clarity, insight and calmness. You will be in greater control of your thoughts and emotions and relate to the world without becoming involved with it. This is the secret the ancient seers mastered. Through the practice of yoga they learned to detach themselves from their minds and bodies and became centered in their witness selves. The Upanishads refer to the Observing Self as the true Self (Atman), and the Yogasutras as Isvara, the lord of the body and the mind. Whatever name you may give, as long as you remain focused on this Self and become centered in it you will experience things differently. Although the Buddhists do not believe in an eternal Self, they do believe in the witness Self, which they consider transient and subject to rebirth, karma and modifications. They practice mindfulness to become centered in it and gradually dismantle the formations and aggregations that make up the personality. For a spiritual person, the observing Self is like a sanctuary. Our chances of experiencing peace and stability are greater when we are centered in it. It is helpful even in worldly life. In my experience, I find that when I am my observing Self, I am in greater control of my thoughts and emotions and I become more observant and intuitive. I am also able to fathom the true nature of other people, their hidden motives and thoughts, and the masks they wear. It also helps me in decision making and problem solving. The best way to enter this state is by focusing your mind upon your breathing and slowly becoming mindful of what is happening in you and around you. Another approach is to practice the "Not This, Not This" method (neti neti) mentioned in the Upanishads and remind yourself that you are not your mind and body. Ethical self-cleansing, breathing, concentration and meditation are also helpful. Anyone can practice this wonderful technique and develop an expansive and mindful awareness. In this stress filled world of ours, it is extremely helpful to practice detached observation and remain in control of yourself. To perfect this practice, you have to know that you are neither your mind nor body but a Witnessing Self, who is here to observe and enjoy this world of objects, unending perceptions and wonderful creations, without becoming attached to them. You have to plant this idea firmly in your mind, remembering from time to time that that you are the observing Self and your purpose here is to observe the world consciously and learn valuable lessons about yourself, the world and others from it. If you persist in your practice, gradually the idea will take root in you and you will become detached, composed and collected in your daily life, relationships, thinking and actions. You will bridge the gap between the observer and the observed, and grasp the essence of things that is not perceptible to the ordinary senses.